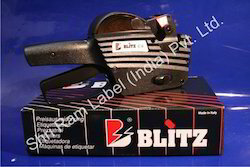 Backed by the rich industry experience, we are manufacturing and supplying best quality Price Marking Machines & Rolls. The offered range is manufactured by utilizing optimum quality material in compliance with international quality standards. Highly appreciated for unmatched quality, durability, long service life and cost effectiveness, it is broadly demanded in the market. Our entire range is available in a variety of sizes to fulfill the variegated demands of the clients. We are involved into wholesaling and distributing of Marking Machines. Our products are manufactured using latest technology to offer technically advanced range of products. Owing to rich industrial experience, we have emerged as global leaders in this competitive market.